Ball was asked about dealing with the big shoe companies, and he said they will regret not making a deal with him after his son is picked by the Lakers. "Now that Lonzo's headed to Los Angeles, what they should have done is give me a billion dollars and let me be on my way," he said. Told that number was unrealistic, Ball replied, "unrealistic to you." "Now you know ... if they want to talk to me now, it just went up to $3 billion. Triple B's -- billion, billion, billion," he said, adding: "That's the only way they going to come at me. I'm already in the building. I don't need them for nothing, as you can tell." A source confirmed to ESPN's Darren Rovell that Ball's asking price with the big shoe companies was indeed $1 billion. Fox Sports reporter Kristine Leahy, whom Ball earlier referred to as a "hater" and told to "stay in your lane" after she pressed him on the number of shoes sold, argued that for Big Baller Brand to be appealing to the big shoe companies, he would have to market his products to women. Ball scoffed at the idea. "Yeah, if you have a women's company. ... We're talking about Big Baller Brand," he said. Later in the interview, after several tense exchanges with Leahy, Ball said: "I never disrespect women, but I tell you what, if you act like that, something's coming to you and it's OK."
seriously what are the chances the lakers pass on Lonzo because his dad is a lunatic. i would say extremely low but i'm sure there are discussions abt him going on right now. lavar apparently believes that the strongest hand you can play is to pretend you hold four aces, not realizing that your opponent has a couple of aces in their hand and know how to count. idk about that but it is true that lonzo tweeted a list of top 5 alltime rappers that included both dmx and 50 cent. my latest theory is that lavar has concluded that the best way to make money out of his kids is to raise his media profile as high as possible and hope lightning strikes. he's correct to think that being a boastful, trash-talking, loud-mouthed quote machine will get him notoriety in the sports media, but he's still a long way from figuring out how he can personally cash in on that. I sometimes wonder who the first already in the NBA guy to sign with BBB could be, if we lived in a fantasy where that could happen. Javale? JR? yeah i mean mission accomplished apparently there were 45,000 people at the ZIon vs Lamelo game last week. from now on I vow to ignore any and all """news""" items about this fuckhead. life is too short and yeah it's not good to give these types any attention. Ha. I guess I didn't really come around til his cowherd appearance. I played football and baseball, sorry, but said to be the best bball player in N.Y. State-ask coach Ted Dobias-said best he ever coached. So many trump name drops in hip hop history. 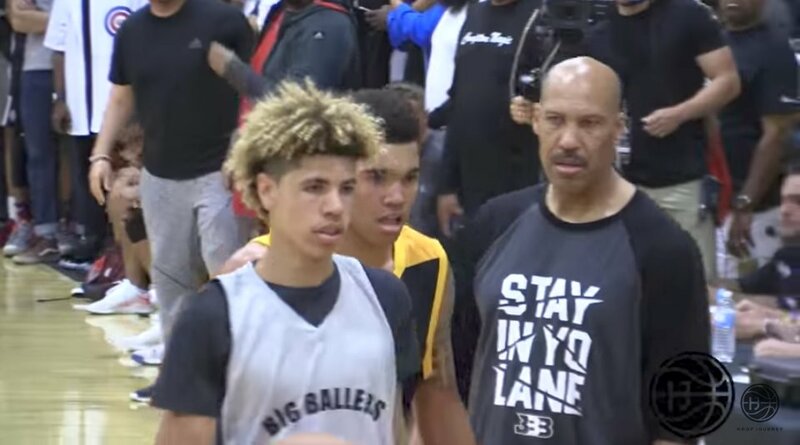 so lamelo is technically ineligible to play college ball now right? Can't wait for Lavar to undermine LiAngelo's g-league coaches. Our boys are comin' home!! "Luke Walton was the worst coach he ever had. It was Magic Johnson who said he was going to be the dang face of the franchise. But Magic ain't doing no coaching. And the only person to kill Lonzo is the coach pulling him out and not having no confidence in him. Everyone who's had confidence in Lonzo just let him go and let him win. That's what he does. He wins. Luke Walton turned him into a loser. A loser's mentality is like, 'Oh, he's young, he'll get it.' Instead of just letting him go out there and do what he does." Everyone who's had confidence in Lonzo just let him go and let him win. Someone should tell Lavar that the NBA is a different beast than high school, club, or college hoops. Lavar may be on the make, but this is the big leagues of people on the make and he needs to up his game if he wants to compete. Why doesn’t Lavar speak into existence a better shot for Lonzo? think Lonzo ever gonna grow a pair and tell dad to stfu? not too likely from what I can see. imagine growing up browbeaten every day, and being told that all your success is due to your dad riding you like a saddle horse. Bron: Follow my lead to win a championship. more like follow my lead while my agency backchannels to trade your asses. wait until lavar goes after Obamacare. then the analogy will be complete. The Lakers found out about Ball’s situation when Lonzo Ball called General Manager Rob Pelinka, and the organization informed him that they would not allow it and could void his contract, sources said. This could have been a disastrous moment for the Lakers, with a core player potentially undergoing a procedure that could have blindsided the organization. But Johnson and Lakers General Manager Rob Pelinka communicated with those around Lonzo, working with his then-agent Harrison Gaines to squash the procedure and bring him back to Los Angeles, sources around the team with knowledge of the situation said. Gaines declined to comment when reached by phone. done by someone who had heard of dice but had never actually seen them. really just depends i guess idk bad tats can be fine.